The graphical editor of Perfect Cut received a lot of improvements, accessible through the menu if not specified otherwise. 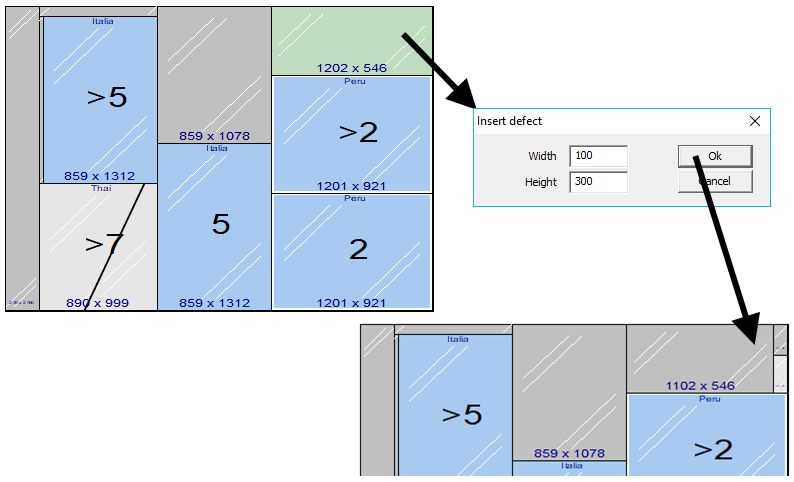 Addition of “Set Trim X or Y“ for a specific cutting scheme, adding a new sheet with the same parameters but different trim in the project. A new configuration parameter “Force exhausted pieces with standard pieces” allows to insert pieces over the defined quantity, adding them as standard pieces. The quantity of standard pieces has also been changed to show the total of pieces inserted/pieces insertable. Layouts can now be divided in two different layouts depending on the part of the layout selected. It’s now possible to separate the repetitions of the entire project (right click on the project name) or of a single family (right click on the family name), in addition to the menu on the layout. When a layout is duplicated, it’s now possible to choose if adding it right after the original layout or at the end of the list. In addition, the possibility of creating single projects for each layout has been added. By double clicking in the note fields in the pieces window, it’s possible to open a new window that helps with managing the subfields of the note. It’s also possible to change the subfield names clicking on the name of the subfield, for example it’s possible to change «Subfield1» to «Country». 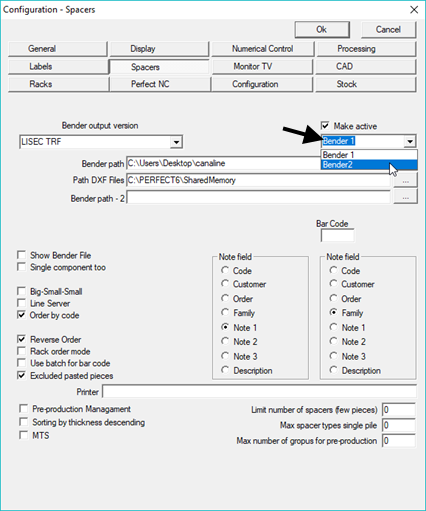 It’s now possible to change the parameters of border X, border Y, and minimum cutting distance of a sheet in the project even if the sheet is already used in some schemes, if the new parameters are lower than the original ones. 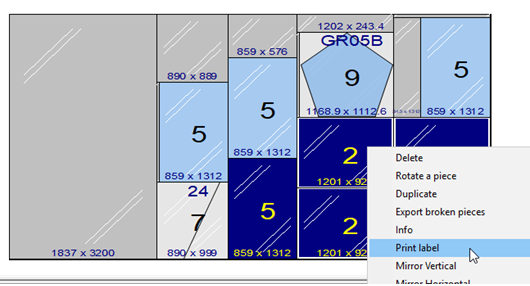 It’s possible to print the labels of one or more pieces selecting them directly from the layout view in Cut or TV. This direct print ignores the settings of «one each type», «one each package» and NO_LABEL. 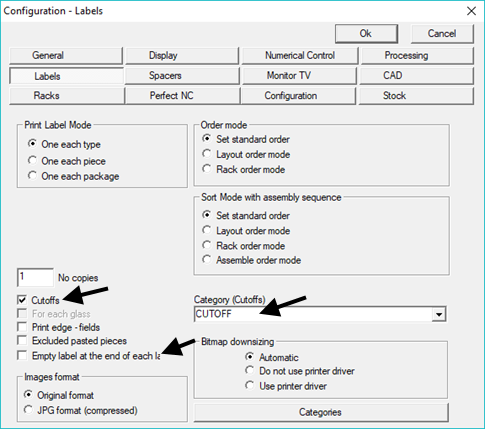 In the Label configuration it’s possible to enable the printing of labels for the cutoffs and choose with category of label to use for these. It’s also possible to enable the printing of an empty label at the end of a scheme to help the operator to differentiate the labels for the layouts. 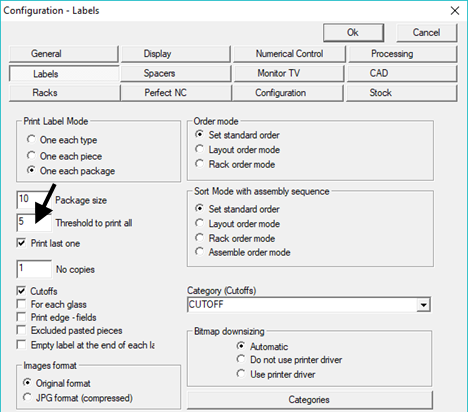 For the setting «One every package», it’s possible to define a threshold to print all, under which the labels will be printed like the «One each piece» mode. With «Print last one», the label for the last package will always be printed regardless of its size. The possibility of calling the print of the associated label of a certain piece via batches for Perfect Label has been added, which ignores the settings «One each type», «One each package» and NO_LABEL. It’s not possible to define a second configuration for the output for the spacers. This can be a completely different machine, or the same one but with different parameters. The management of pieces under the minimum cut size has been improved, which are now moved to the end even in cases of cutting levels after X. The field “RackNo” in the ISO file is now differentiated for the same piece if the rack assigned is different and «Rack» is set in the numerical control configuration. In the configuration of Bottero machines it’s now possible to choose which information should be viewed on the monitor of the machine (code, code-client, code-order, etc). It’s possible to define the maximum length of the field reference (on the old machine 5, newer ones 15). Shape names take a progressive number from 1000 to 9999, to avoid overwriting. Low-emission management with multi-steps, also for the shapes. The compability with Lisec GTS PROD R4.06.120 and ORDER R5.10.041 has been ensured, managing the entities of only coating (without cutting) in some particular cases. It’s now possible to define aliases for the name of the rack type, adding them to the file ALIAS_RACK.TXT in the section [RACK]. For example adding 000017CV=A will show the rack 000017CV as «A» instead. In the «Subdivision of jobs» configuration it has been added the parameter «components» for the shipping racks, allowing to order the pieces single-double-triple on the racks. It’s now possible to select multiple blocks of pieces by pressing the key SHIFT, removing pieces by pressing DEL and cancel an operation of cutting by pressing ESC. It is possible to select the desired operations (move, delete, etc.) from the list below the list of the pieces contained on the stacks, and select the stack by clicking on the row of the totals of the stack.